There is a whole world of squash out there that I’m just beginning to try. Growing up, a squash in any form never grazed the dinner table. I had only heard of zucchini and had no idea that you could even cook with the varieties of squash that showed up in the grocery stores in the fall. 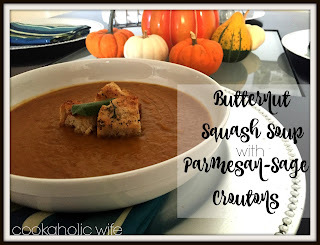 I can’t remember if it was zucchini or butternut squash that I tried first, but for the sake of the fall season, let’s say that it was butternut. I quickly realized I had been missing out on a world of flavors. 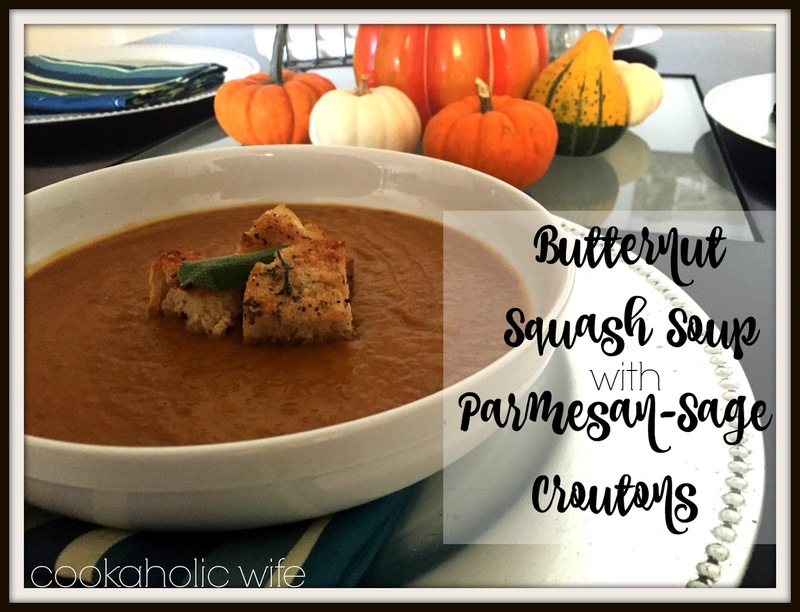 On it’s own, there isn’t a huge amount of flavor coming from the squash but it goes so well with so many different spices and seasonings creating entirely unique combinations. Of course, like anything else that’s a vegetable, Tom doesn’t like it. He’ll occasionally eat a bite or two if it’s mixed in with something else, but something like a soup where the squash is the main ingredient? Nope. Which means I get to spend the better part of the fall and winter season having all of these recipes for lunch. It’s funny, I made this soup last week and then realized I didn’t have anything prepared for the Improv Challenge this month. Would you believe that the ingredients for November are squash and sage? How amazingly perfect was that? It was like my brain somehow knew this (granted, I did read the ingredients but that was months ago) and just so happened to remind me to make this soup right in time for the challenge. 1. Preheat the oven to 400 degrees. Spray a large baking sheet with non-stick cooking spray. 3. In a Dutch oven, heat the butter with the remaining 1 tbsp. of olive oil over medium heat. Add the onion, celery and sage. Cook, stirring frequently for 10 minutes or until the vegetables have softened. 4. Add the squash and the broth and bring to a boil. Lower the heat and simmer for 30 minutes. 5. Meanwhile, prepare the croutons. Reduce the oven temperature to 375. 6. Cut the bread into 1 inch pieces and toss together in the large bowl with the sage, olive oil, Parmesan cheese and salt. Spread into an even layer onto a baking sheet (if using the one from the squash, just blot any excess oil with a paper towel first) and bake for 10-12 minutes or until golden brown and crisp, flipping pieces over once halfway through the cooking. Set aside. 8. Divide the soup among bowls and top with the croutons. Divide the Parmesan cheese among the bowls and serve. I took this for lunch last week and it was incredible. It reheated really nicely in the microwave and the croutons stayed crispy in a plastic bag all week. The soup is rich with flavor and hearty enough to keep you full for hours. As much as I love squash of just about any variety; it pains me to say I have never had any in a soup. I must try this soon if not sooner. ack! Home-made croutons are my weakness. Your soup looks quite tasty, Nichole! 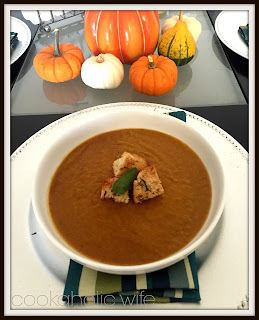 Gotta love squash soup! The croutons were a fantastic idea!